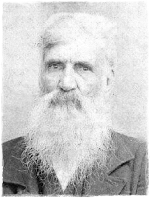 [S1257] Family History of Billy R. Wilson [http://familytreemaker.genealogy.com/users/w/i/l/Billy-R-Wilson], Billy R. Wilson, MrBRWilson@wmconnect.com, 2503 Flamingo Drive, Sebring, FL 33870 . John C. Hare Sr. was born about 1763 possibly in Cumberland County, NC the son of John Hare and Margaret [maiden name unknown] Hare-Kosht. He married Elizabeth Owen. No information is available to show when or where, or Elizabeth's ancestry. We do not know for sure that John had a middle initial. He was John Sr. and had a son John C. Jr. Therefore, he must have had the same name as Junior. The C. probably stood for Calhoun which was a prominent middle name in the family, and may be the maiden name of Margaret Hare-Kosht, John's mother. John and Elizabeth had eight children all born in North Carolina: John C. Hare Jr. born about 1785; Henry Bryan Hare Sr. (our ancestor) born about 1787; Elizabeth Hare born about 1789; Owen Hare born about 1791; Terricy Lydia Hare born about 1792; Mary Catherine Hare born about 1793; Peter Hare Sr. born about 1797; and Euphrania Frances Hare born about 1807. John and Elizabeth moved their family to Wilcox County Alabama soon after the treaty of Fort Jackson, Alabama, August 9, 1814 which opened up the land formerly occupied by the Creek Indian Nation. The exact year could not be established but John and John Jr. died about 1823, nine years after the treaty. Since both died at the same time it appears a disease like malaria or yellow fever may have taken them. Who knows maybe Indians killed them or worse yet they may have killed each other. ESTATE OF JOHN HARE SR. Present the Hn. Edwin L. Harris, Esq. Judge County Court on application of Mark Morgan for Letters of Administration on the estate of John C. Hare Sr. deceased and it having made appear to the satisfaction of the court that the widow of the said John Hare Sr. deceased is unwilling to take upon herself the administration of the said estate and the said Morgan being one of the legal heirs (in right of his wife Euphrania Hare) of said estate, it is therefore ordered by the court that letters of administration on the said estate of John Hare Sr. be granted unto Mark Morgan. It is ordered by the court that Mark Morgan give bond and security in the amount of two thousand dollars as administrator of said estate and that John A. Evans and Wm. H. Plummer be accepted for his security. Ordered by the court that Wm. McLendon Esq., Frederick Autery, Joseph Morgan, Nathan Sheffield, John A. Evans or any three of them are and they are hereby appointed appraisers of the estate of John Hare Sr. deceased. WRITER'S NOTE: Since this man is listed as John Hare Sr. and since he had a son John C. who was a junior, it is assumed that the senior John was John C. Hare Sr. and that his first son was John C. Hare Jr. For some reason, Mark Morgan (husband of Euphrania Hare) was removed as administrator of the estate and was replaced by Euphrania's brother Peter Hare, John Hare's son, four years after the proceedings began. Know all men by these presents that we, Peter Hare, Ephraim Pharr and Nathaniel A. Jameson are held and firmly bound unto James C. Irvin, Judge of the County Court of said county and his successors in office in the final sum of one thousand dollars which payment well and truly to be made and we bind ourselves our heirs executors and administrators firmly by these presents given under our hands and seals this 14th day of May A.D., 1827. The condition of the above obligation is such that whereas the above bound Peter Hare has been duly appointed Administrator to the estate of John Hare deceased together with his last will and testament of the said John Hare deceased annexed hereunto. Now if the said Peter Hare shall well and truly perform all of the duties which are or may be by law required of him as such administrator then the above obligation to be null and void. Otherwise to remain in full force and virtue. WRITER'S NOTE: The following document was found in RECORD OF ESTATES 1820-1861, Moore County, NC Vol. B, Page 74. PETER HARE ADM. OF ESTATE OF JOHN HARE SR.
August 13, 1823 The property of John Hare Snr. deceased, one judgment an John Sheffield Jr. for the sum of $30.15 due the 30th Oct. 1822. One judgment against Everett Sheffield Jr. and Medford Owens for the sum of $95.00. Judgment against Everett Sheffield, John Sheffield Jr. and Medford Owens for the sum of $92.00. One note against Everett Sheffield and Medford Owens for the sum of $23.00 due 4 Dec. 1822. One note on Mark Allen for the sum of $1.27 due June 6, 1823. One note in Everett Sheffield for the sum of $0.50 due June 6, 1823. One note on John Owens Sr. and Medford Owens for the sum of $1.00 due Sept. 1814. One note on James Williamson for the sum of $3.25 due May 13, 1823. Doubtful are proved accounts against the estate of Isom Sheffield decd. for the sum of $3.50 proven 15th Nov. 1822 Doubtful. Probate Minutes, Orphans Court, Wilcox County, Alabama. Mark Morgan Administrator of the estate of John Hare deceased appeared in open court and made application for a final settlement of the estate of the said John Hare deceased. It is therefore ordered by the court that the second Monday in November next be appointed as the time for making said settlement and it is further ordered that publication thereof be made by advertisement in a newspaper printed in Clairborn once a week for three weeks previous to said term and also by notice posted up at the door of the court house and two other public places in the county at least forty days before said time. The inventory and appraisement of the estate of John Hare Sr. deceased was examined and approved and ordered to be recorded and filed. James C. Irvin, Judge County Court Wilcox County Alabama. This 18th day of January 1828. [S1356] Ancestry.com user Gary Peacock [rgarypea49].